Hemoglobin A1C is a component of hemoglobin which attaches to blood sugar in the body. Hemoglobin A1C measurements are the standard for evaluating glycemic control in diabetics. 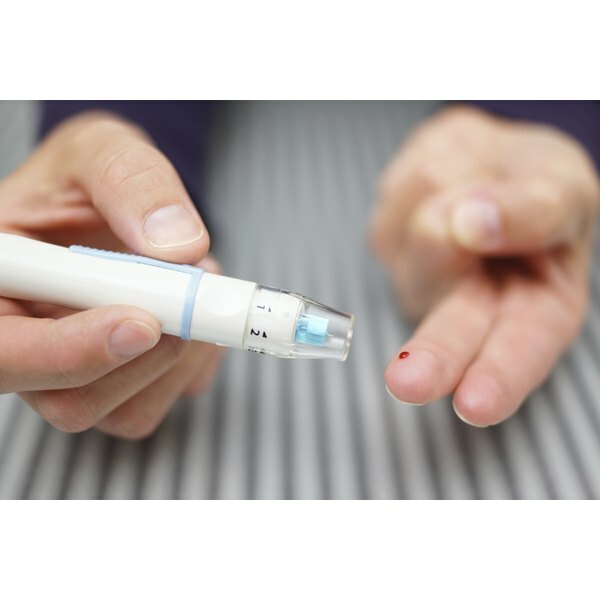 Diabetics should be monitored regularly to ensure proper glucose control. Hemoglobin A1C is measured by a blood test every three months and interpreted in the form of a percentage. Two readings above 6.5 percent indicate diabetes or inadequate control of sugar levels, according to "Pharmacotherapy: A Pathophysiologic Approach." Diabetics should have a blood glucose monitor to measure blood sugar levels every day. A physician may able to help the patient choose a glucose monitor that is best for him. Maintaining blood sugar levels within the normal range will prevent complications, such as nerve damage, kidney damage and blindness. Treatment of diabetes helps to control blood sugar levels and may include oral therapy and insulin injections. Lifestyle modifications, such as eating healthily and exercising regularly, also provide protection against complications. What Is a Glucose Standard Curve?